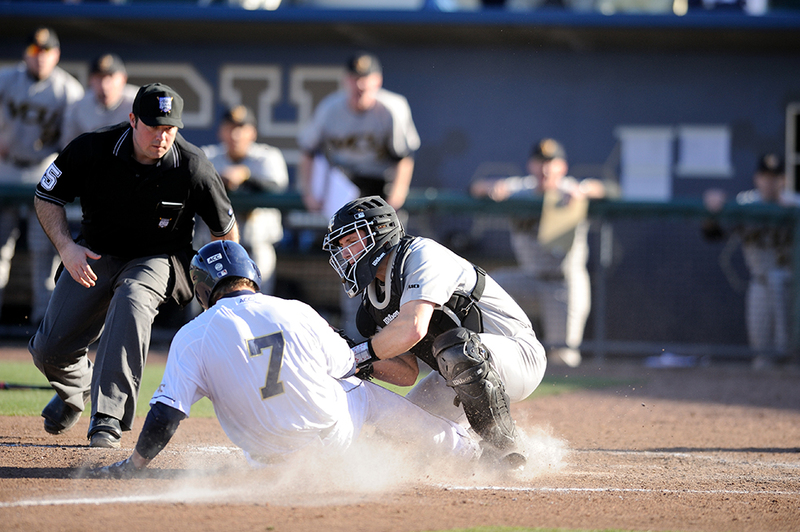 The Jackets opened their 2014 baseball season last weekend with home games against Old Dominion, Radford and VCU. Along with the team opening their season, several Tech freshmen made their collegiate debuts, with four surprisingly starting in the season opener. Catcher Arden Pabst and designated hitter Elliot Barzilli were two of the freshman to start in the opener, and it did not take them long to show why Hall had confidence in putting them out there. In the bottom of the second, after a double by Tech outfielder Matt Gonzalez, Pabst tripled in his first career at bat to give the Jackets their first run of the season. Two batters later, after Pabst scored on a ground out by fellow freshman Brandon Gold, who got the start at third base for the Jackets, Barzilli ripped a home run over the left field fence in his first career at bat. Barzilli finished the game 1-2 with a walk and an RBI, and Pabst finished 1-4 with an RBI. Tech defeated Old Dominion 6-5. “It was an awesome feeling. I didn’t try to do too much up there. I just try to play the game and good things happen,” Barzilli said. The fourth freshman to start was right fielder Ryan Peurifoy from Peachtree City, Ga., but was he replaced by freshman Keenan Innis in the fifth. Overall, the five freshmen combined for three of Tech’s six RBIs and three of the nine hits in the season opener. Freshman Ben Parr also made his debut on the mound. Parr was brought in to set up a lefty, lefty matchup, but was unable to get the out. Parr was pulled after one batter, but would later pitch an inning on Sunday against VCU. This is a huge difference from last season when the Jackets only had one freshman start on opening day, designated hitter Matt Gonzalez. Only two freshman, outside of pitchers, saw significant playing time last season, with Gonzalez starting 58 games and Daniel Spingola starting 21. Spingola’s significant playing time was mainly due to an illness forcing starting center fielder Brandon Thomas to miss several games that season. Of all the freshman, Pabst may have the most difficult task, replacing All-ACC first team catcher Zane Evans. Evans led the team last season with a .341 average and 66 RBIs before getting drafted by the Kansas City Royals. Though Pabst is replacing Evans, he tries not to compare himself to him, knowing what a productive player Evans was for the Jackets. “He was an unbelievable player and if I start comparing myself to him, I’ll have an uphill battle. I’m just going to go out there and do the best I can every single day, and hopefully one day I can be put in the same category as him,” Pabst said. In the second game of the weekend, Gold and Barzilli started, but Puerifoy was replaced by Innis in right field and Pabst was replaced by senior catcher Mitch Earnest. Pabst would relive Earnest in the sixth inning. Unlike in the first game, the group of freshman struggled in a 3-1 loss against Radford, but they weren’t the only ones who did not perform well. Tech managed just two hits in the entire game, one each for senior shortstop Mott Hyde and junior first baseman A.J. Murray. The four freshman would combine to go 0-9. Freshman pitcher Zac Ryan made his debut in the sixth, pitching one inning, while giving up one run and striking out two. The group of freshman, and the team as a whole, had a more productive day on Sunday against VCU, but still found themselves on the losing end. Pabst got his second career start, and bounced back to go 1-3 with a walk. Innis also got his second start, and, like Pabst, got a hit and a walk. Making his career debut against VCU was second baseman Connor Justus, who went 1-3 with a walk and an RBI. The Jackets also fell to 1-3 on Tuesday night after a 4-3 loss to Georgia Southern. They will next take the field tonight for a three game series against UNC Greensboro.